Looks much better after it's grouted. I think it looks great. The sheen on the rocks can be further addressed by more aggressive spot polishing with a slight abrasive within the first 24 hours after grouting if you want (provided that's all it is without much epoxy residue). Think of the worry-free performance and you'll really like it. Yeah, getting rid of the sheen involves some scrubbing later today. I’m still debating whether to use straight vinegar or Soft Scrub w/bleach. If I can’t get the sheen off today, then I’ll try to remove it with a chemical next weekend. BYW, your finger sponge tip was a good one -- thanks again! Anyone try TSP (Tri sodium phosphate) to remove grout haze? Looks super good!! That Spectralock is some amazing stuff. It will be there for a long time. 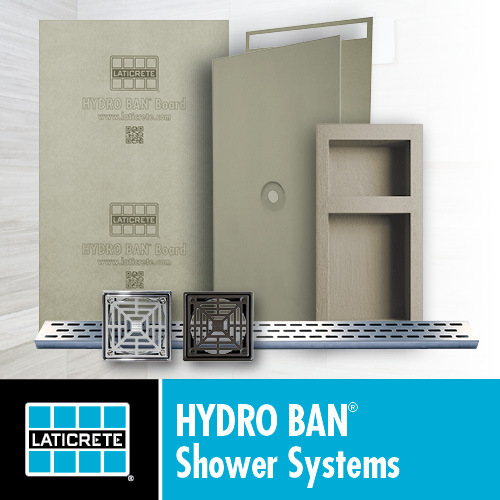 Looking forward to a long-lasting, hassle-free shower area! After vigorous scrubbing with a mixture of vinegar, ammonia, baking powder, and water (2x) as well as Soft Scrub — all with hot water rinses, the shiny sheen is off but there is still a dull sheen that refuses to come off. I can live with that but my wife is not totally satisfied with the results. So next Saturday I might try Miracle’s Epoxy Grout Film Remover. Dunno if that would even make a difference. - Floor as it is now with a section of the original tile placed on it. You might be able to remove the sheen, but that kinda comes with using epoxy and pebbles...it basically seals them. I would reccomend using Stonetech epoxy grout haze remover. My wife picked out some corner shelves at The Tile Shop. I didn’t pay much attention to them until after I notched the tile and cemented the tile to the wall. Turns out these corner shelves are designed to stick on top of tile. You need to use either a Polyurethane Construction Adhesive OR GEL Epoxy to secure them to the tile (per manufacturer Questech). Since I'm not sticking them to tile but to Kerdi, do you think Bostik Ditra-Set will be adequate in securing the shelves to the wall? How 'bout a link to the product in question, Chris? The material type indicates it's cast stone (resin-based). Not sure how you're gonna get that installation to look right with the contoured edges of the shelf set into the cut tiles, Chris. They've clearly designed the shelf for their surface installation only. As for bonding to your membrane, that's not an issue if you're setting the shelf into your tile surface. You'll get all the support you'll need from the tile surface whether the edges of the shelf are actually bonded or not. You could likely use their double-sided tape to hold the shelf in place while you tile around it, though. The contour is there but barely noticeable (at least to me) but will show a bit in the grout lines. There will be a row of glass tile directly above the shelves so that should help draw the eye away from the contoured shelves. The main concern for me is that thinset will secure the shelves to the Kerdi/tile. Spectralock pro premium grout will also hold the shelves into place. I'm putting the shelves in last--don't want a ceiling tile coming loose and nailing a shelf!